Christian military schools for boys near Chattahoochee, Florida. Learn more about military schools and academies for struggling boys in Chattahoochee, FL. – troubled teen boarding schools and therapeutic boarding schools. Need Help with an At-Risk Boy? Though Not in Chattahoochee, Florida, Would You Consider Gateway Christian Military School in Florida Instead? 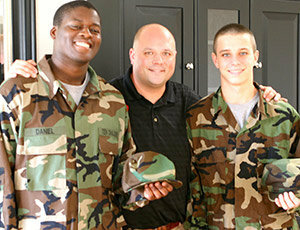 Gateway Boys Academy is a lower cost military school in West Florida like no other. We are a military academy, an accredited school, as well as a working ranch and farm offering counseling and mentoring, competitive team sports, a spiritual emphasis, and hands-on outreach to help disadvantaged people in third-world countries. All of these are meant to bring about change in a boy’s heart and life. With the structure and order of a military school, wayward teen boys soon turn into respectful, confident leaders and responsible citizens. Over 1000 boys from each of the 50 states and internationally have put their lives back on track at Gateway Boys Academy. We enroll boys from around the country, including from Chattahoochee, Florida. Gateway Boys Academy serves boys ages 11 to 17 who have chosen a dangerous path in life. Our military school is situated in the panhandle of Florida, and our campus is reachable from Chattahoochee, Florida and cities throughout the nation. While the program is very disciplined and structured, we believe in demonstrating the love of God to every cadet, surrounding him with compassionate care. Several of our staff have been in your shoes, either having been through a similar program themselves or having enrolled a son of their own in our military school in the past. Teens start in our basic training platoon beneath the supervision of drill instructors. For the first few months, physical exercise, a packed schedule, attention to cleanliness and chores provide them with structure and establish order in their lives. At Gateway, boys realize they can stop struggling against authority and begin to grow in confidence by mastering challenges that are constructive instead of their previously destructive activities. Over time, they promote to higher levels, obtaining privileges and responsibilities along the way. The senior level military school cadet is allowed to do off-campus sports, outreaches, and travel. Most teens who had been failing or falling behind not just get caught up but get far ahead. We meet all qualifications by the State of Florida for high school graduation, and students earn diplomas when they complete our academic program. Classes run year-round as students work at their own pace through first-rate curriculum and certified teachers. Our high standards allow students to transfer back to public institutions or to go on to college or the military. We emphasize spiritual life at Gateway Boys Academy. We strive to introduce every cadet to a relationship with Christ and strive to maintain a Godly atmosphere favorable to Christian growth. Students attend group Bible studies, go to chapel twice weekly, and work with a counselor to discuss individually assigned Bible studies meant for character growth. At Gateway Boys Academy, we concentrate on family restoration. After four months, parents begin attending weekend events for training about boundaries and constructive parenting. Although it is not located in Chattahoochee, Florida, Gateway may be just the environment your boy needs to make a positive change. Please call or submit our inquiry form for our boarding school today. Excerpt about Christian military schools near Chattahoochee, Florida, used with permission from Wikipedia. Should you need help finding alternative schools, Christian help for troubled teens, affordable boarding schools or help for troubled teens, please let us know. Boarding schools for boys, like this Teen Challenge military school for boys and boys homes, offers behavioral therapy for troubled teen boys and teen counseling in a structured boarding school setting. Unlike most boot camps and military schools, Gateway is a long-term residential program that helps at-risk teenage boys; boys with anger, oppositional defiant disorder (ODD), attention deficit disorder (ADD), attention deficit hyperactivity disorder (ADHD). Gateway no longer operates like boot camps or military schools but retains the structure and discipline of military academies. Our school is similar to military schools and can be referred to as a “school for troubled teens”. Such troubled teen schools and residential treatment programs for teens are often quite costly, but this one of few military academies and residential schools for teens that is affordable. Christian military schools for boys near Chattahoochee, Florida. Learn more about military schools and academies for struggling boys in Chattahoochee, FL.